Etihad Airways, the national airline of the United Arab Emirates, and The Tourism Authority of Thailand have signed a landmark US$1.25 million agreement to increase tourism to Thailand. Under the new agreement, the Abu Dhabi-based airline and TAT will jointly promote travel to Thailand from priority markets including the United Arab Emirates, UK, Ireland, Belgium, France, Germany, Italy, Spain, Switzerland, South Africa, Iran and Kuwait. 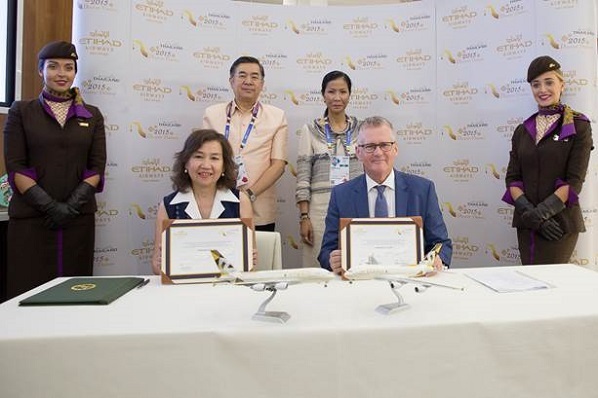 The agreement was signed by Etihad Airways senior vice president marketing, Shane O’Hare, and TAT’s acting governor Juthaporn Rerngronasa at a commemorative event in the Etihad Airways-Alitalia Pavilion at Expo Milan 2015. They were joined by Kobkarn Wattanavrangkul, Thailand’s minister of tourism and sports and high-ranking officials from both organisations. O’Hare said: “Etihad Airways has a long and proud association with Thailand – in fact Bangkok was one of our first international routes. “It continues to be one of the busiest in our network enjoying strong year-round demand, particularly from the UAE, GCC, Middle East, Africa and Europe. “With five daily flights to Thailand – four to Bangkok and one to Phuket – Etihad Airways has a significant investment in Thai tourism and the new agreement with Tourism Authority of Thailand supports and extends that commitment. In 2015, TAT has set a target of 28 million international visitors generating an estimated 1.35 trillion Baht (US$41 billion). Rerngronasa said: “Europe has long been a prime market for Thailand. We have also seen an increase in visitors from the Middle East and Africa. Etihad Airways launched its Bangkok route with daily flights in April 2004. It added a second daily service in June 2006, a third daily flight in April 2012, and a fourth on July 1st this year. The airline added Phuket to its Thai network in October 2014.